This beach club has now closed permanently. 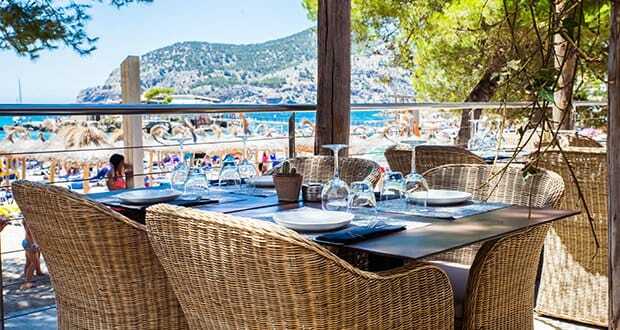 Supermodel Claudia Schiffer famously once owned a property in Camp de Mar – which is also the home of Golf de Andratx. 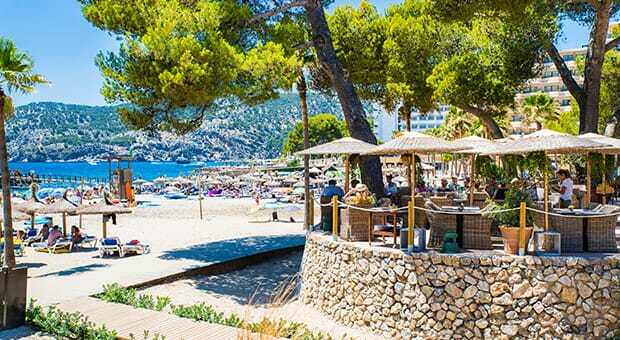 Now, this resort in Mallorca’s southwest has something else to shout about: Accana Summer Club. 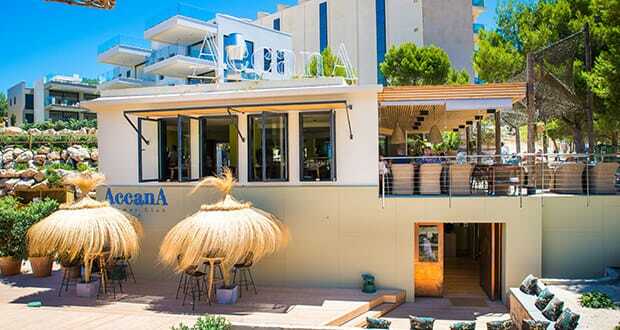 Opened mid-May 2016, the smart Accana Summer Club is a seasonal establishment offering food, drink, and relaxation. 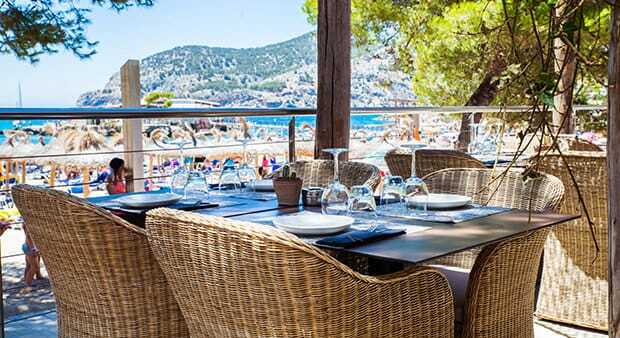 Its beachfront location couldn’t be better – book ahead for a table and they’ll reserve sunbeds on the beach for you. 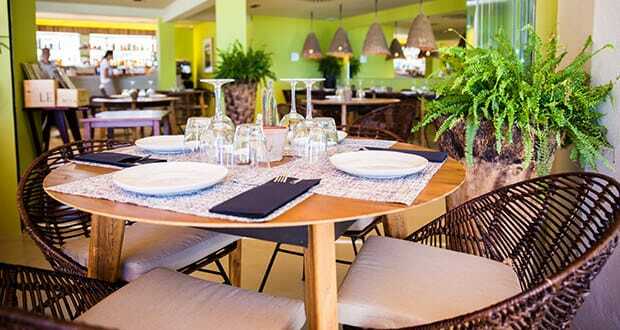 Accana Summer Club’s manager Lucia Quijada told us that the owners named the place after an African village they’d spotted on Google Earth. 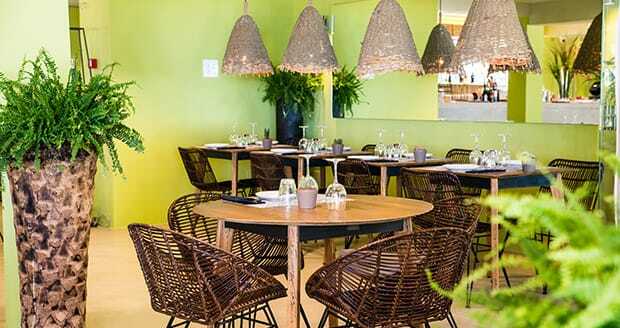 The chill-out bar certainly has the feel of a luxury safari lodge and even has a few African mama chairs. As well as cocktails and other drinks, you can eat snacks and light bites in this area. A short walkway links to the restaurant, where we had a choice of tables in the sun or in dappled or full shade for our lunch. The décor, welcome sea breezes, and gorgeous view are reasons to come here. But, as we discovered, the food and service are also pretty good. We first shared two dishes from the menu section headed ‘from the garden’ (with several dishes suitable for vegetarians). 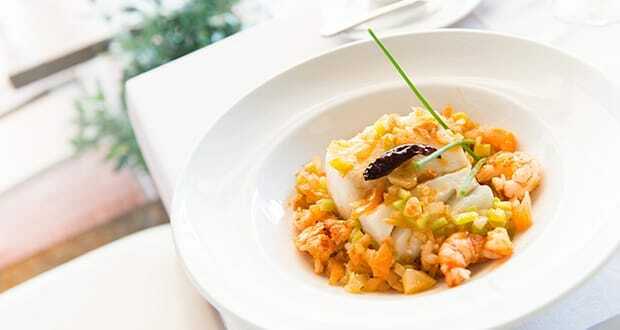 The well-seasoned-and-dressed Mallorcan ‘trampó’ salad with grilled cuttlefish was deliciously refreshing. 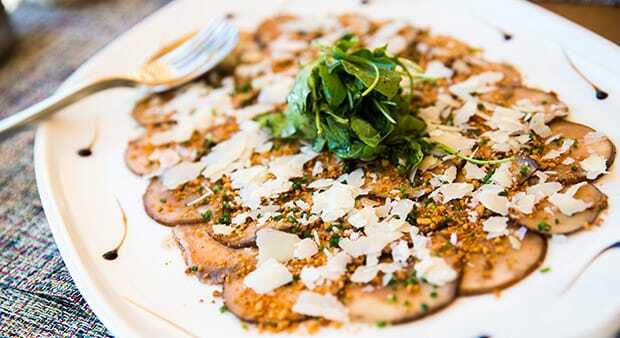 For us, though, the stand-out dish was the Portobello mushroom carpaccio with truffle oil and Parmesan – a revelation. It was enough to make you want to rush home and retrieve the mandolin from the kitchen cupboard. 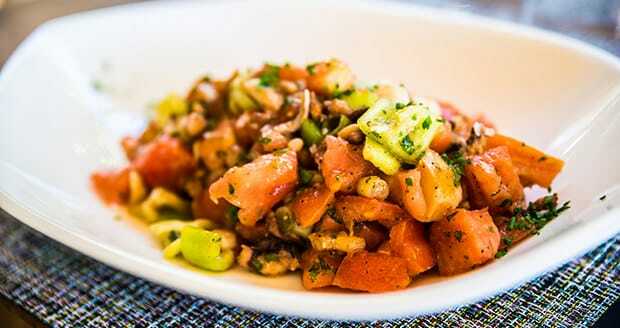 Note: portions of these two dishes were generous and sufficient for sharing. If you like seafood when you’re by the sea, the good choice here includes a lobster stew and the classic lobster with fried eggs and potato. 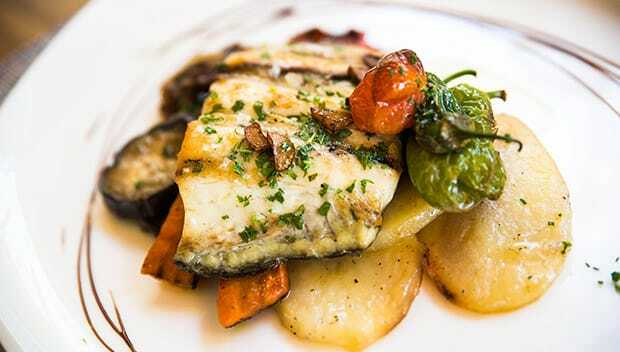 We shared a portion of grilled sea bass presented on thinly sliced potatoes and vegetables. Chef Alberto Vidal previously worked in Madrid, but is a native of Valencia. So we had to try one of his rice dishes: ‘arroz a banda’, or ‘rice on the side’. 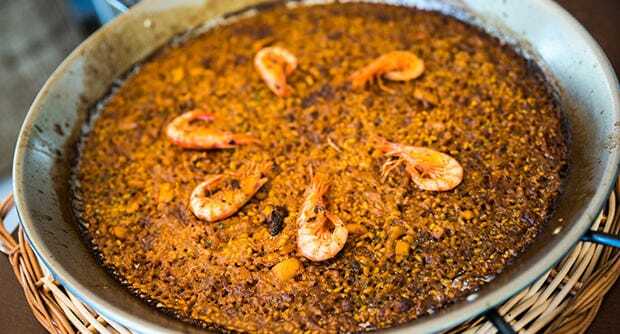 The flavourful rice (garnished with a few prawns) was presented in a paella pan and a separate dish contained pieces of seafood and new potatoes – which we put together on our plates. 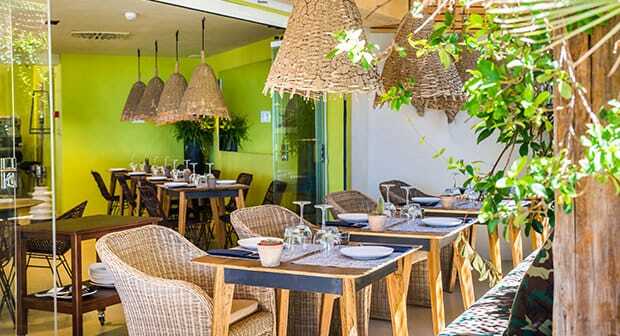 Accana Summer Club has still more to offer. For the 2017 season the rear garden area will have a swimming pool, another bar, and 60-70 sunbeds for clients. See what you’re missing, Claudia? 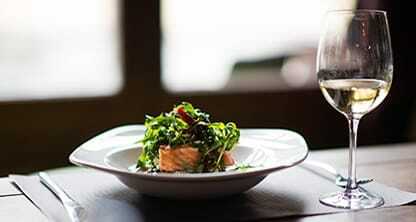 Accana Summer Club is open until the end of October. 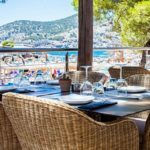 We hope you have found this article about the Accana Summer Club – a Camp de Mar highlight useful and that you have many memorable stays in Mallorca as a result of our recommendations.